Some days are more creative than others - and seeing something ordinary from a different angle can be your spark. 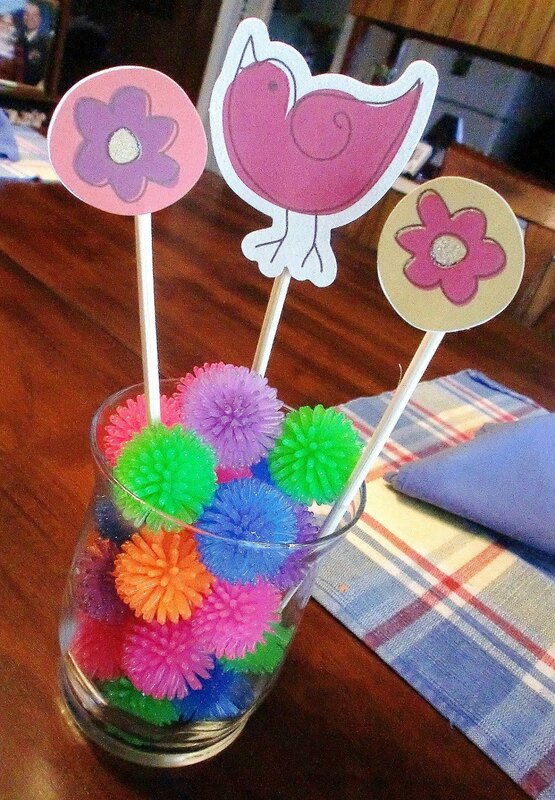 I had a bunch of these smooshy rubber balls left over from this week's Sunday School lesson. The lesson was on praising the Lord, which has nothing to do with smooshy rubber balls, I suppose. You had to have been there. So into this glass jar they went. They were 5 for $1 at Target in their Spring dollar section. The bright colors made for a lovely display, but something was still missing. Also at Target I found these lovely Spring, glittery die cuts. A little tape and a handful of skewers and I had a sweet, simple decoration. Think about modifying this design for your particular needs - primary colors and some cake images for a birthday party. Muted colors and simple labels for place cards at your party. Darker colors and leaves for a fall theme. The possibilities are endless when you've got simple ingredients to work with!